Rolling Blackout C.F. 's new EP is for indie rock fans alone and can’t stretch past the borders of the genre. If I read one more “rock is dead” headline, I think I might die. It’s a lazy narrative, but I can support lazy narratives if they are true. But rock isn’t dead; it's just not popular. The distinction is important because a lack of popularity often can bring with it a renewed sense of classicism and creativity. 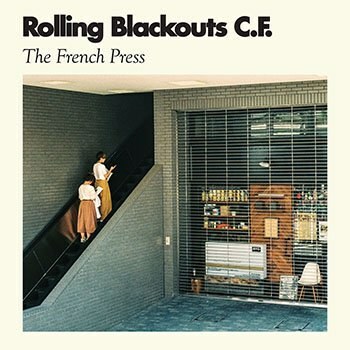 The French Press, the new EP by Rolling Blackouts C.F., ultimately lacks both while still maintaining a relatively positive rock experience. The title track grooves thanks to a tight rhythm section and a reverb guitar, plus Julian Casablancas's inspired vocal delivery. The guitar solo is a bit too simple to be compelling, sounding more like a teenager playing notes off a music sheet than a moving, expansive moment. They would have been better served to cut the song short; it runs out of gas after about four minutes of its over-five-minute runtime. “Julie’s Place” sounds like a Strokes demo fronted by Teenage Fanclub. It's youthful in its appeal but confident in its execution. When the chorus hits, it's just “yeah". Like a Beatles or Tame Impala chorus, you wonder if you have heard it before or it’s a cover because of how instantly memorable the melody is. Going against pop wisdom, they wait until the second minute to hit the chorus with an extended hold, and it pays off handsomely. “Sick Bug” has a pinch of angst and heavily accented syllables. By the third chorus, the repeated “I want you” is tired, and I can’t imagine playing this song every night on tour. The echoed bridge is nice but not enough to save the track from indie mediocrity. The guitar hook on “Colours Run”, however, is one of the best on the record. The acoustic guitar on “Dig Up” reminds me why this instrument is so maligned. The strum pattern is so painfully plain that almost anything would be an improvement. A chugging electric or an accented pattern could have improved what we have here. Even the vocal performance sounds more like a place-holder than a final take. Ending track “Fountain of Good Fortune” has a solid repeated line in the title, but the generic lyrics and guitar work and drumming can’t make this into a must-listen. Ultimately, this record is for indie rock fans alone and can’t stretch past the borders of the genre. The influences are apparent but many -- the Strokes, Modest Mouse, Built to Spill, a pinch of Pavement, a handful of Yo La Tengo. While channeling but not living up to any of those artists, your time with Rolling Blackouts C.F. will likely have you reaching for a classic record than a repeated listen.